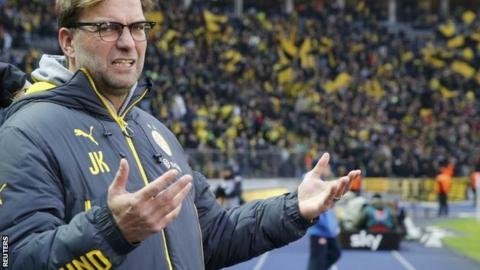 Borussia Dortmund dropped back into the relegation play-off place after losing to fellow strugglers Hertha Berlin. Julian Schieber, who left Dortmund for Berlin in the summer, scored the only goal as the hosts overtook last season's runners-up in the table. Jurgen Klopp's side, who have won only four of 15 Bundesliga matches this season, admitted before the game that "we're in a relegation battle; we've accepted the situation the way it is". Despite their domestic struggles, they qualified for the Champions League last 16 as group winners ahead of Arsenal. Match ends, Hertha Berlin 1, Borussia Dortmund 0. Second Half ends, Hertha Berlin 1, Borussia Dortmund 0. Nuri Sahin (Borussia Dortmund) wins a free kick in the defensive half. Foul by Julian Schieber (Hertha Berlin). Attempt missed. Nuri Sahin (Borussia Dortmund) right footed shot from outside the box is too high following a corner. Corner, Borussia Dortmund. Conceded by Hajime Hosogai. Corner, Borussia Dortmund. Conceded by Nico Schulz. Attempt missed. Ciro Immobile (Borussia Dortmund) header from the right side of the six yard box is close, but misses to the left. Assisted by Pierre-Emerick Aubameyang. Attempt blocked. Adrián Ramos (Borussia Dortmund) header from the centre of the box is blocked. Assisted by Ilkay Gündogan with a cross. Corner, Borussia Dortmund. Conceded by John Anthony Brooks. Attempt blocked. Jakub Blaszczykowski (Borussia Dortmund) right footed shot from a difficult angle on the right is blocked. Attempt saved. Ciro Immobile (Borussia Dortmund) header from the centre of the box is saved in the bottom right corner. Assisted by Nuri Sahin. Foul by Roy Beerens (Hertha Berlin). Offside, Borussia Dortmund. Ilkay Gündogan tries a through ball, but Adrián Ramos is caught offside. Substitution, Borussia Dortmund. Nuri Sahin replaces Neven Subotic. Substitution, Hertha Berlin. Fabian Lustenberger replaces Ronny. Attempt saved. Marcel Schmelzer (Borussia Dortmund) left footed shot from outside the box is saved in the bottom right corner. Assisted by Adrián Ramos. Offside, Hertha Berlin. Thomas Kraft tries a through ball, but Ronny is caught offside. Corner, Hertha Berlin. Conceded by Neven Subotic. Attempt missed. Neven Subotic (Borussia Dortmund) header from the centre of the box is high and wide to the right. Assisted by Marcel Schmelzer with a cross following a corner. Corner, Borussia Dortmund. Conceded by Thomas Kraft. Attempt saved. Mats Hummels (Borussia Dortmund) header from the centre of the box is saved in the top left corner. Assisted by Marcel Schmelzer with a cross. Corner, Borussia Dortmund. Conceded by Peter Niemeyer. Attempt blocked. Ilkay Gündogan (Borussia Dortmund) right footed shot from outside the box is blocked. John Anthony Brooks (Hertha Berlin) is shown the yellow card for a bad foul. Foul by John Anthony Brooks (Hertha Berlin). Substitution, Hertha Berlin. Hajime Hosogai replaces Per Skjelbred. Substitution, Hertha Berlin. Johannes van den Bergh replaces Änis Ben-Hatira. Attempt saved. Ciro Immobile (Borussia Dortmund) right footed shot from the right side of the box is saved in the centre of the goal. Assisted by Sven Bender with a through ball. Foul by Peter Niemeyer (Hertha Berlin). Attempt missed. Änis Ben-Hatira (Hertha Berlin) left footed shot from a difficult angle on the left is close, but misses to the left. Assisted by Ronny with a through ball. Jens Hegeler (Hertha Berlin) wins a free kick in the defensive half.